I am a writer and an unashamed cat fanatic. For reasons that I will not go into here, I was not blessed with two-legged children so all my children have four legs and fur coats. I love all things furry but am particularly passionate about felines. I’ve shared my life with many amazing felines. Getting to know them and learning about their behavior affords me the opportunity to take a look at the world through their eyes. Now, before you shake your head and decide that I’m a wacky crazy cat lady who believes my cats are actually speaking to me I’ll explain that I’m a writer of fiction and writing in a characters “voice” comes quite naturally to me. As I watch my cats I find myself thinking about how I would write in their voice, what their facial expressions indicate what they’re thinking. The day I decided to put these thoughts into writing, a blog was born. 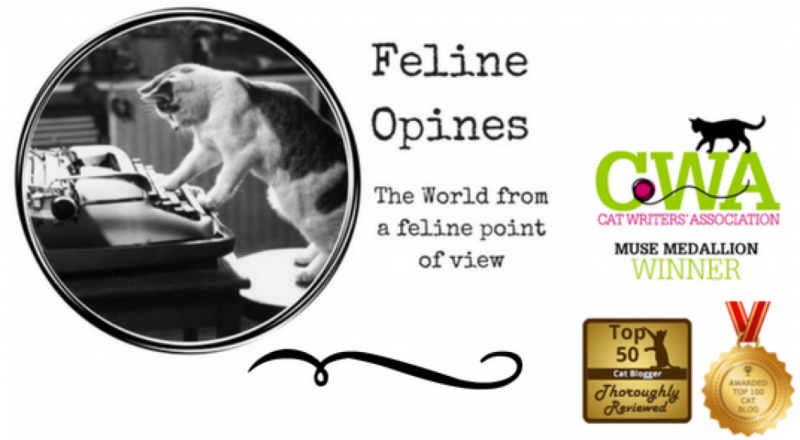 I hope you enjoy Feline Opines. Some posts are funny and whimsical (because cats are funny and whimsical) but there are serious posts as well. My cats have a lot to say about many subjects and they (as am I and the “male human”) great proponents of feline welfare and adoption. The Trive of Five will sometimes turn the keyboard over to other felines and even the occasional human when they feel so inclined. I hope you enjoy this wacky, furry view of the world. Good morning! I hope you don’t mind, but I nominated you for the Liebster Award. You can check it out at https://peanutfreemigrainemom.wordpress.com/2016/03/02/liebster-award/ if you want to keep it going. Hi Anita – I wanted to reach out to you about Purrfect Fence – not sure if you are familiar with us? We’ve been around for close to 15 years keeping many thousands of cats happy, healthy and safe outdoors. We’ve also donated product and been featured several times on “My Cat from Hell” with Jackson Galaxy where we have helped him solve several different behavioral issues on his show by allowing safe access to the outdoors. Hello, Miss Anita. I am excited to find your blog. I am my humans’ fur baby along with the Basset Hound, as they decided many years ago that they did not want human children of her own. We give them constant joy, as I am sure your kitties give you. I look forward to visiting again soon! So glad to meet new friends. I wrote a story that was in the last Chicken Soup for the Cat Lover’s Soul called, “All My Children Wear Fur Coats” and it’s about how we have four-legged rather than 2-legged kids and how much we love and enjoy them! Snoops and Kommando Kitty, Alberto would be honored and The Tribe of Five are happy to allow him to be their spokespurrson! Are you going to BlogPaws? Samson & I are & would love to room with you again! Please get ahold of me! Sam has new sunglasses, and i have a new line of art that I want to get out there- Day of the Dead Kittens! To bring awareness to the plight of shelter kittens & change the odds! So good to hear from you. I didn’t respond right away because (as I did last year) I got a registration for my husband and told him he needed to let me know if he really was going this year. He is coming this time so I won’t get to room with you and Sam, bummer!! I can’t wait to see you guys though (Sams new sunglasses and your art). Looking forward to hanging out at BlogPaws!